Big News for Big Sur Travelers! 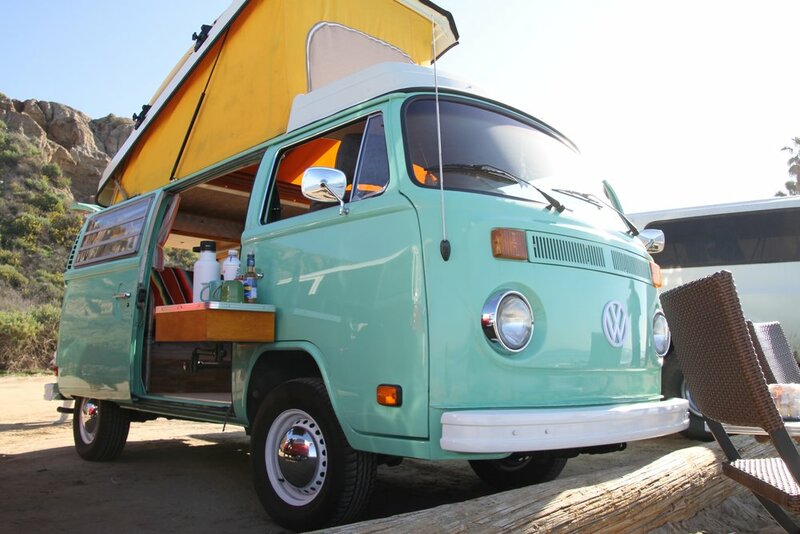 We, at Vintage Surfari Wagons, will be leading a group of 12 classic Volkswagen Camper Vans into the heart of Big Sur this October. Check out the deets on our Group Camp Tours page... we have 8 buses left and one has your name on it! 20 peeps, 2 canines, and 11 Vdubs gathered outside VSW headquarters - stoked and ready to roll along in a California quintessential sorta way out to Lake Havasu for one of the biggest VW events on the planet, Buses by the Bridge. Joshua Tree, Route 66, Havasu, Parker Dam, Le Haut Desert Aerie (cherry on top), and cruising thru the Cali desert were our expedition hi-lights. Chef and famous rock n' roll photographer Ed Caraeff (@thebucketlisttrip) joined our crew supplying us with savory vittles as we journeyed together. The takeaway, new friendships forged, and a road trip to be remembered for a lifetime! Vw Surfari RoadTrip from Eric Linus on Vimeo. "Recreational vehicles used to be as fashionable as sandals and socks. That's all changed, as millennials find their inner nomads - Instagram feeds such as van.crush (117,000 followers) or vanlifers (245,000 followers) give a sense of the cool factor. Retro campervan rentals, via companies such as Vintage Safari Wagons, will ride the revival next year, as nostalgic travelers don't necessarily want to drop thousands on a rig they'll use only a few times a year..."
First Comment: Stoked to see an article mentioning little old us in an American Airlines publication! Second Comment: Tsk, tsk, the spelling of our name is incorrect, it's SURFARI, you didn't do your homework did you? Third Comment: We've been riding the revival wave for 13 years now, and hopefully it will continue far on into the future. We kinda think so... VW's simply ARE nostalgic... Inherently iconic, the quintessential California road machine, there's nothing that compares. Fourth Comment: For those of you that don't know (that would include the writer of this American Airlines article), we, at Vintage SURFARI Wagons, ALSO turn VW interiors into 'high-end interiors' and 'camping beasts'. Amen. For the past few months we've diligently poked, prodded and ultimately transformed this neglected VDub into a beauty of a Bay... it's hard to say goodbye, but it's time to hand Buscation back over to it's Mummy 'n Daddy. Client wishlist: Southwestern vibe - check!